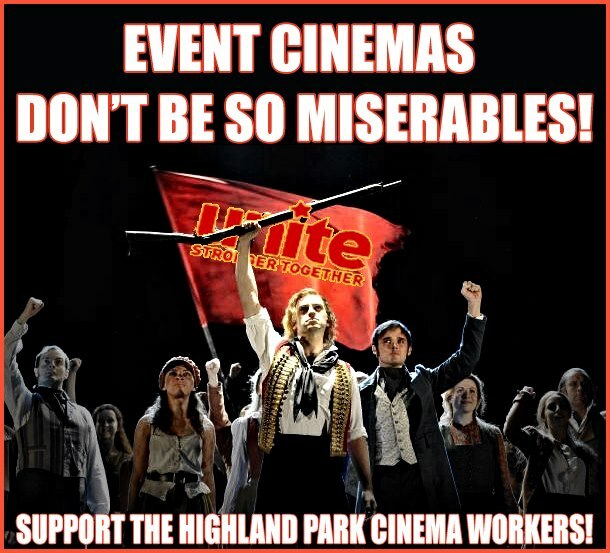 The Workers of Event Cinemas in Highland Park picket their cinema. Some have worked there for 16 years, yet the company only offers them 2 weeks pay redundancy. Do you hear the people sing? 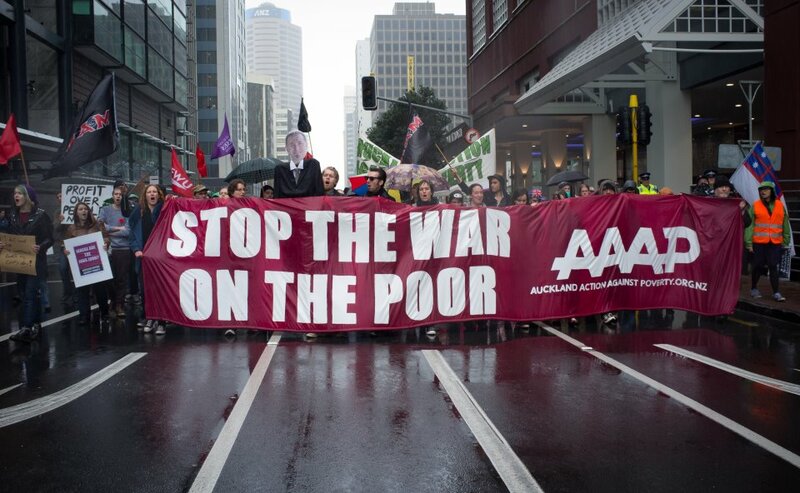 At 430pm today, the workers will rise up against Miserable bosses at an Auckland site. Les Miserables jumps off screen and comes to real life in an Auckland cinema. 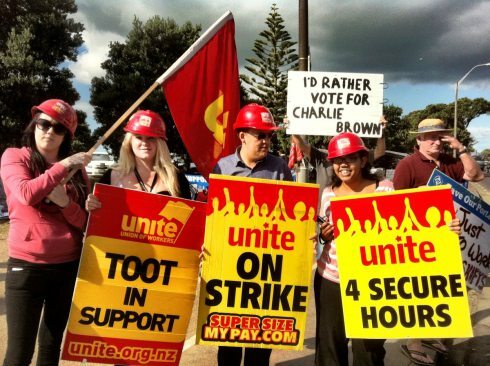 The dozen or so workers at EVENT Cinemas Highland Park theatre in Auckland have been offered only two weeks redundancy pay offered by Australian owned chain. Most of the workers have been there for 5 to 6 years, with some having given 8, 12 and 16 years service. When head office was asked by the Union Union official representing them if they could reconsider, they offered some workers complimentary movie tickets. 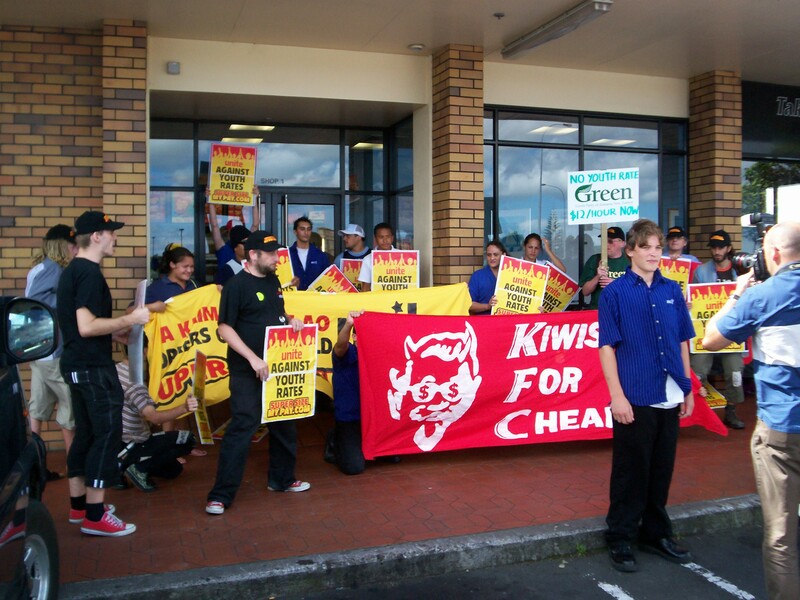 "The workers at the Highland Park site have decided to fight, not only for themselves, but for all workers in New Zealand to be protected by redundancy laws." said Unite Union theatres organiser Joe Carolan. 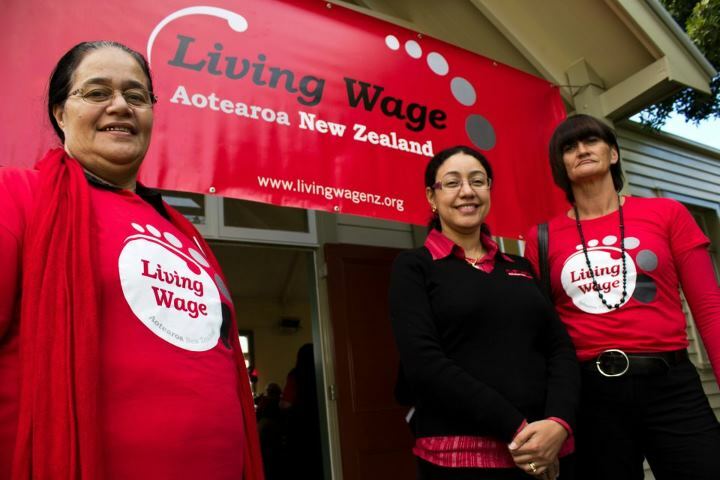 The union, says its time for a minimum four weeks redundancy, and 2 weeks for every additional year worked as recognition for length of service. Today they will raise their red flag at the Highland Park site at 430pm. Further actions at EVENT Cinemas are planned for Saturday night, and the day of closure next Wednesday. 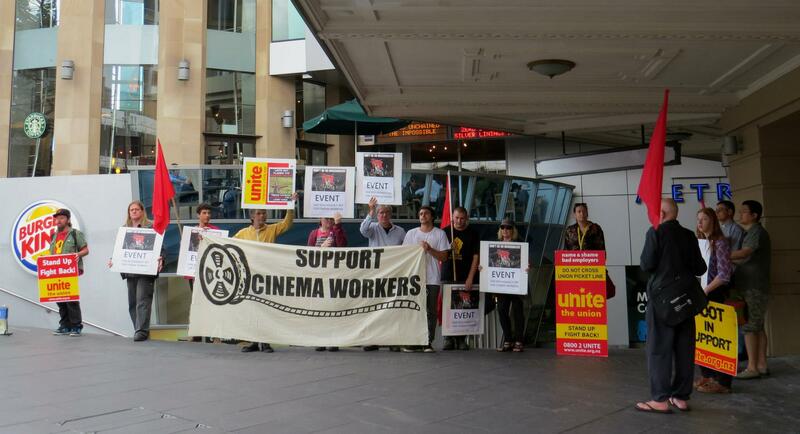 A petition in solidarity is being circulated nationally in every unionised cinema, including the Hoyts and Readings chains. Joe and the cinema workers can be contacted today at 029 44 55 702. With the announcement of Fox Studios that they will stop the distribution of 35mm films, the Digital Rollout in Aotearoa has speeded up in both Hoyts and Events. By the end of 2012, the share of 35mm will decline to 37 percent of global cinema screens, with digital accounting for the remaining 63 percent. This will accelerate, and as Universal and Warner Brothers wind down their 35mm operations, spells the end of an era in cinemas. Workers in Reading Cinemas should also prepare themselves. Unite is there for all workers facing this Digital Rollout. We will argue for redeployment where possible, with workers at least keeping the payscale and hours that they had before. The working class principles of Last IN, First Out should apply to any remaining projectionist shifts. For those who do not want to move to Front of House and wish to move on, we will fight hard for the best exit package possible, to fit the workers length of service to the company. In the last few weeks, several workers have contacted Unite, highly distressed that their hours have been cut without explanation. In all these cases, the Union was successful in restoring their hours back up to previous levels. Our union agreements provide different protections in different companies. Every delegate and member should know which clause is important to police in our contract on the sites and notify the union when a new Manager violates these conditions. (a) the worker normally works 25 hours per week or more. 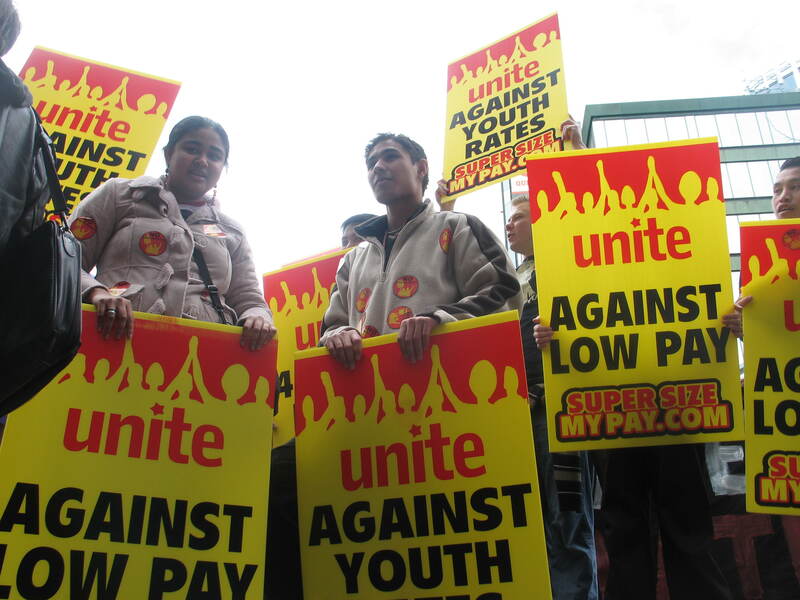 Workers who fulfil these conditions are targeted for scheduled hours, based on the agreed availability for work at the start of their employment. They shall be offered additional regular shifts before new employees are employed. Any reduction in hours must be fairly distributed across the board- any worker who loses more than 25% of their hours should contact the Union immediately. Clause 5.2 of the Restaurant Brands agreement states that “Any additional hours that become available either as a result of an Employee resignation or an increase in a store’s capacity, shall initially be offered to existing Employees. Wherever practical, such additional hours must first be offered to the Employee with the most service for the appropriate qualification required. If through a reduction in a store’s capacity there are less hours available, then the reduction of hours shall be spread fairly and reasonably across Employees”. “Employees within the coverage of this contract with 3 years of service or more are eligible to select a minimum number of guaranteed hours of work per week, providing that the minimum number is less than 30, and that the employee has open availability. Employees with open availability on six days per week are eligible to select….less than 25”. Clause 14 of the Union agreement covers in great detail Hours of Work at Hoyts. There are many conditions placed on workers around availability, shift swaps and rosters. Clause 14.9 also covers the “On Call Roster” for workers looking to boost their hours through increased flexibility around availability. 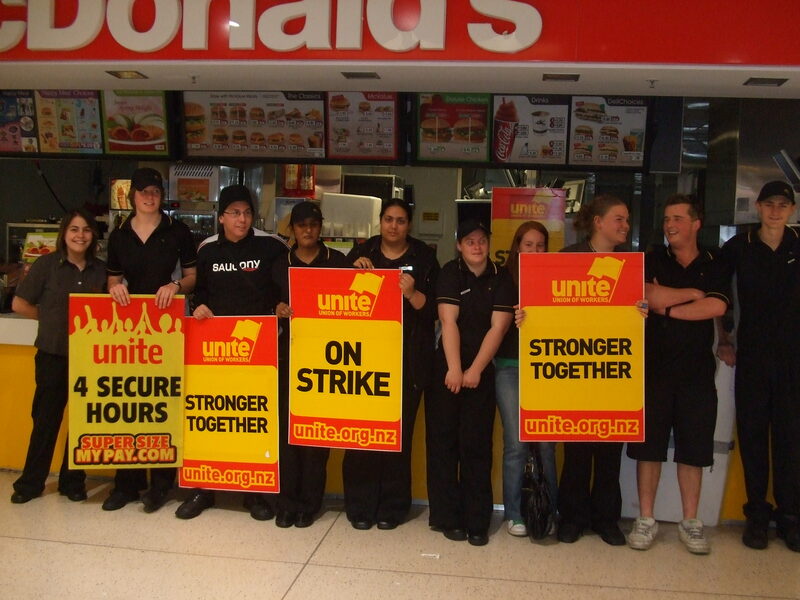 Clause 14.11.3 needs the most policing by Union members on site and is reproduced here- “Where additional regular shifts become available due to an increase in business or a reduction in staff these shifts shall be offered to existing workers, wherever practical, before new staff are employed”. “Where additional regular shifts become available due to an increase in business or a reduction in staff these shifts shall be offered to existing workers, wherever practical, before new staff are employed”. These provisions must be enforced by delegates and union members on site. Managers should be educated in these legally binding conditions, subject to the union examining and scrutinising the fairness of application of provisos etc. An active union on site will make these words the law, and will root out any instances of favouritism, nepotism, bullying or disciplining workers by reducing their hours unfairly. Contact your, delegate, organiser or the Unite office if you believe this is happening on your site. The campaign for me started at the negotiation table, after our executive managers put their first absurdly low offer on the table. From that instant I knew we wouldn’t be able to secure a fair increase without a ground up movement from our union members. My Queen St members understood what was required and we lead the charge with members walking off shift on the 1st of May, International Workers Day. As the campaign lengthened we remained resolute, confident that the end result would be what we deserve and through our efforts it would be achieved. Although we secured the raises we were entitled to, it was a bittersweet victory as we knew that while we fought hard, our final wage increases amounted to keeping us in the same place, relative to minimum wage. Still the increases we won were far greater than the company initially offered. The strike experience was a great unifying force at our Queen St site, with workers strengthened by the fact that the increases we received were through our efforts. 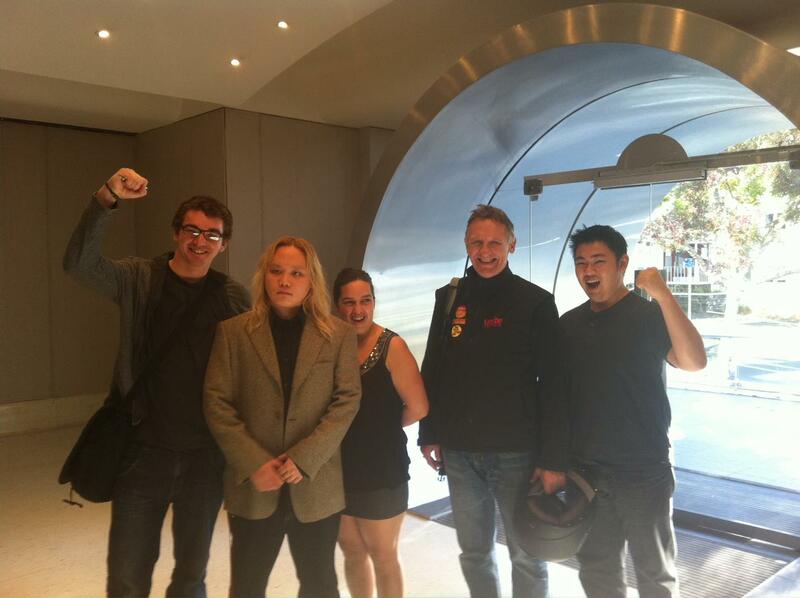 Event Cinema bargaining team. From left: Nathanael Coleman (Queen St); Eric Chang (Albany); Tawera Paapu (Rialto, Newmarket); Mike Treen (Unite National Director); Darren Cheung (Westcity).